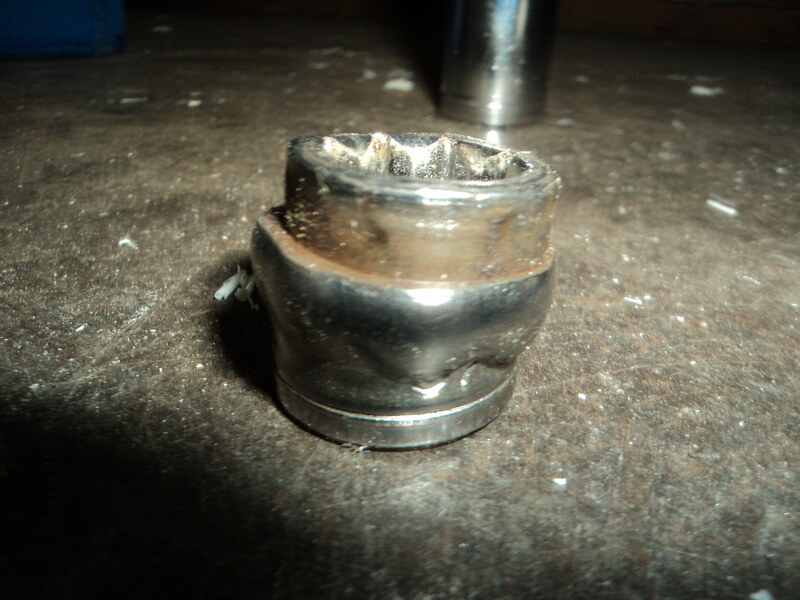 This is what can happen when you are pushing at over 50 tons using sockets. You probably notice that they are not sidchrome. But they were reasonable quality. be careful Zane, i would be wearing a face shield and safety glasses just in case that shattered. shrapnel would make a mess. Looks pretty solid to me . Cheaper to buy another swingarm , I think. Holy crap , If it did that to a steel socket How deformed is the swingarm? Did that with a mate who was new to bikes. Used his new socket set from bunnings in my 20 ten press and made it into a washer. Alternatively one could deploy air tools or use a rotary hammer. The constant banging usually breaks the bonds which bind the axles. We removed a stubborn axle with a rotary hammer and it took about 10minutes before the bonds let go and axle started to move. No collateral damage. The axle had been cut, and all I was given was the centre section that was stuck in the rear engine mount section. I ended up machining a pin to push with and a tube to push the axle section into, which is what I would normally do, but I didn't expect this 60mm long bit to be quite this tight. Once it started to move I kept it going. It did a fair bit of banging and complaining, but with 50 ton up it's arse it was never going to win. The mount section had a few rough bits inside the tube but a quick ream had it looking like new. Tony I think it's out of a Bultaco but don't know what model. The owner had spread the frame a little then cut the axle either side of the engine mount section and then managed to free the 2 remaining axle sections from the frame and swing arm. I did a tough one a few years back, sat the frame with motor sideways in the press and hit the engine mount with a mixture of oxy heat and cold and lube sprays. 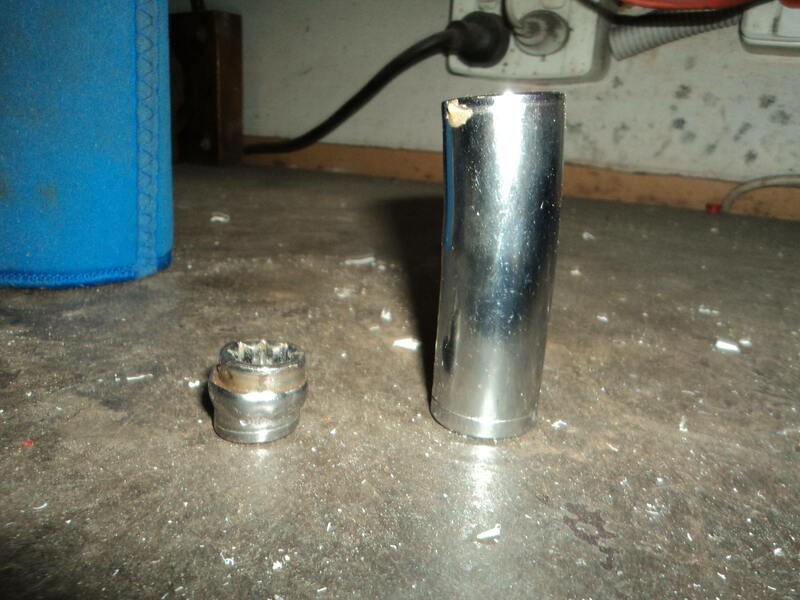 I had a rusted swingarm bolt on a xt500 and I got it out after a month of spaying with wd40 every time I went near it,i still had to support the frame with a spocket for the bolt to go into and I used an stepped shaft the kids make at machining course at tafe along with an 7 pound hammer.i got after the 3rd blow and when out I could see the fish oil in the wd40 had softened the rust on the axle and bearing sleves.see a lot using high pressure sprays at the car wash cleaning dust off their bikes (I live near a desert) and I think poor dude who got to remove the s/arm bolt next! A few months ago I resorted to the hacksaw method to get the seized swingarm pivot out of my brothers 1978 KTM 400. The brother had tried to remove the swingarm about 10 years ago to start restoration of the bike, but when he could't get the swingarm pivot bolt out (seized in the bearing tube) he gave up and the bike went back to it normal position in the back of his shed. The brother had been able to get the pivot bole to move a few mm by use of brute force / extreme violence before he gave up. This made enough room for me to get a hacksaw blade between the frame and the end of the swingarm pivot. Because KTM pivot bolts are made of some really good steel, it took 2 hacksaw blades to cut through each end of the pivot bolt. Once the swingarm was free from the frame, the tube nuts on the end of the swingarm pivot tube (they are a KTM thing) were easily undone and the pivot tube just slide out of the bearings. Luckily, all the required part are still available, so I didn't even try to get the pivot bolt out of the bearing tube..